Time flies when you are working too hard! So go out and take a nice work break but before you roll outside, check out this about 62-centimeter GeoEye-1 image collected over the Austin City Limits festival on October 7, 2017. 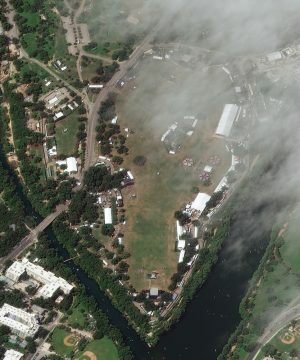 We have covered the Austin City Limits before, also featuring a GeoEye-1 image from 2016. This time our image was collected at a high off-nadir (or tilt with regards to the land below) and it also has a bit of haze-cloud cover, sorry about that! Still a cool image of the festival which by the crowd sizes obviously does not kick-off until later in the day. This entry was posted in The Geospatial Times and tagged Austin, featured products, Texas, The Geospatial Times, Your Imagery Work Break by Apollo Mapping. Bookmark the permalink.